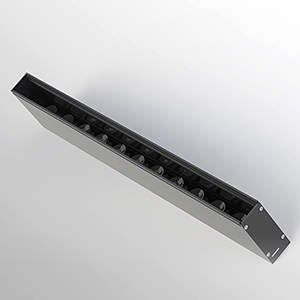 HORIZON V is a linear LED that projects vertical lighting upwards and downwards with strength in a long throw. Its objective is to provide a pixel-free light source and create a perfect flood elliptical beam for grazing or general lighting. With a higher and deeper body than the rest of its HORIZON family, it is factory pre-configured with optic and diffuser in order to get an uniform luminance on the workplane. Due to its configuration, its main feature is to not having any discomfort glare at all when parallel to the fixture. Generally surface-mounted, HORIZON V can also be ordered with a recessed magnetic housing system allowing a quick and easy installation and maintenance. By one simple clicking, the fixture comes in and out from the ceiling. Available in 8W/ft, 10W/ft and 12 W/ft. High and mid power linear LEDs. X= Extrusion available in lengths of 8 inches increments up to 72 inches.